The Super or Combined GMVs are created using multiple events from the same source area with 1 to 1.5 years time spacing. Such time spacing allows more complete coverage by The USArray Transportable Array (TA) stations as it rolls eastward. between 2007 and 2013. Click on the image for a larger view. The Transportable Array (TA) component of the USArray/EarthScope project is a rolling array of 400 broadband stations deployed on a uniform 70-km grid. Ground motion data recorded by this very large aperture array, along with those recorded by other stations from USArray, are used for visualization of seismic waves as they cross the contiguous United States. 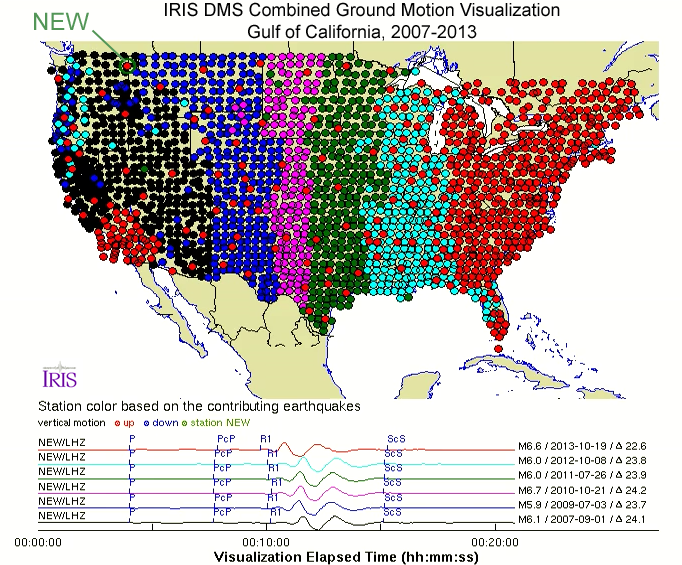 The USArray Ground Motion Visualization (GMV) is a video-based IRIS DS data product that illustrates how seismic waves travel away from an earthquake location by depicting the normalized recorded wave amplitudes at each seismometer location using colored station symbols to represent seismic wave amplitudes. 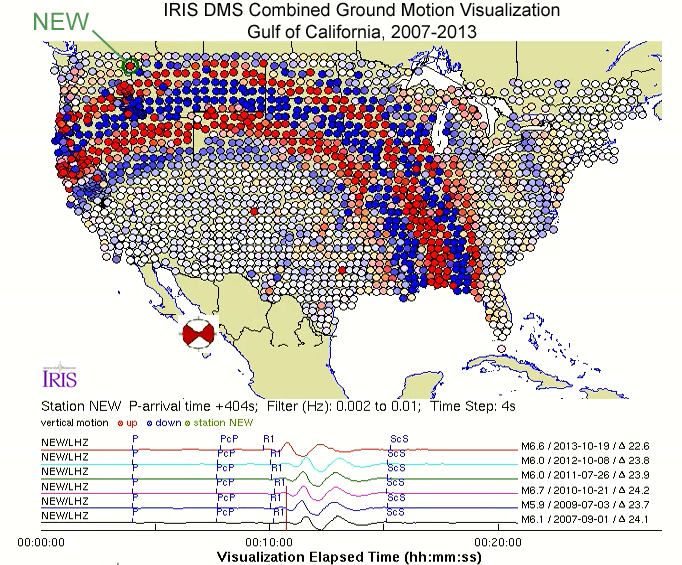 To visualize the ground motion in an area larger than the footprint of the USArray at the time of the event, one can combine GMVs from multiple earthquakes from a common source area spanning different periods in the Array's deployment as it rolls across America. The resulting combined movie, a Super GMV (SGMV) simulates a GMV if all USArray station locations were occupied at once. Figure 1 shows the 6 Gulf of California events with similar focal mechanisms and magnitudes ranging from 5.9 to 6.8 that occurred between 2007 and 2013 and used to create the Gulf of California Super GMV. Additional event sets will be added to the Super GMV Repository as we process more events. Selecting events every 1 to 1.5 years ensures overlapping of ground motion amplitude recordings as the array rolls eastward. For the Super GMV production, each trace (LHZ channel) is normalized to unity and referenced to their respective event origin time in order to synchronize them. Traces from all 6 events are shown in the lower panel from a reference station, NEW (Newport, WA), highlighted in green. For each station, notably backbone USArray and adopted stations, the Super GMV uses data from the most recent of the 6 events. Figure 2 (left) shows the USArray TA station distribution for the 6 events, each with their own station fill and trace (lower panel) colors. 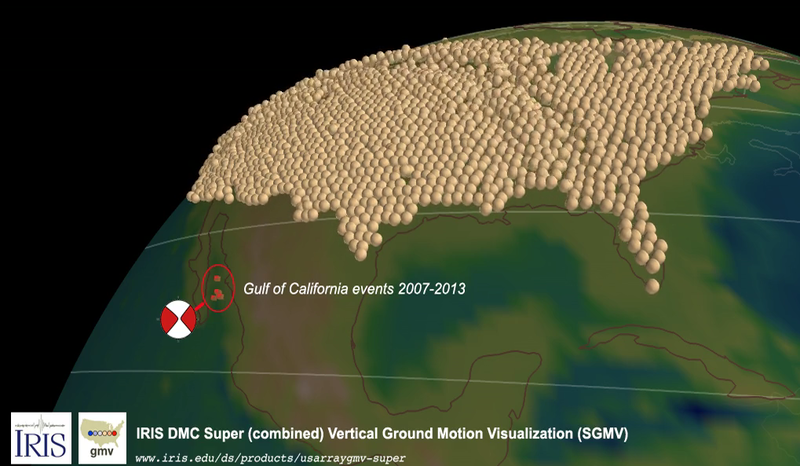 (rigt) A 2-D Super (Combined) vertical component GMV of 6 Gulf of California events (2007-2013) produced using a MATLAB script (click on the image to play the video). 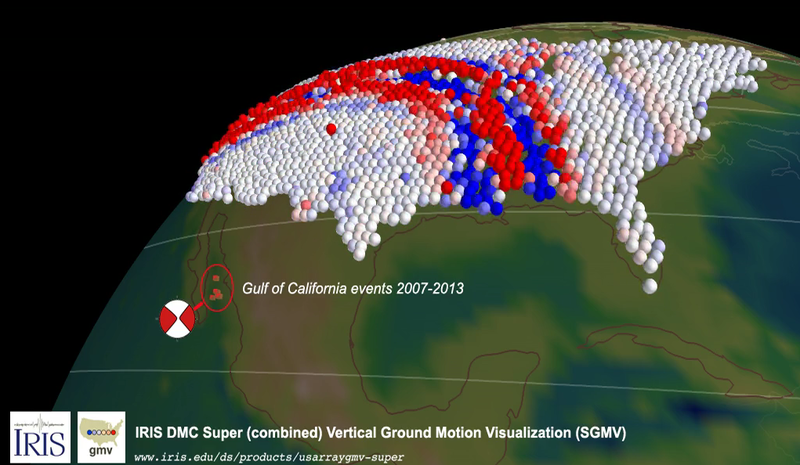 Figure 3 IRIS DS 3-D Super (Combined) vertical component GMV of 6 Gulf of California events (2007-2013). (left) Video with colors depicting ground motion direction, (right) a monochrome version of the video to the left. Videos are produced using Python’s MayaVi Data Visualizer (click on an image to play the corresponding video). Figure 4 IRIS DS 3-D monochrome Super (Combined) 3 component GMV of 6 Gulf of California events (2007-2013) produced using Python’s MayaVi Data Visualizer (click on the image to play the video).